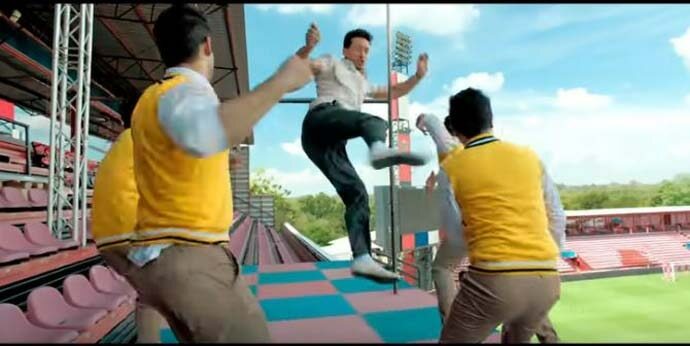 The only real-life thing the trailer shows is when Tiger Shroff works out. Last we saw a chemistry teacher walking about in breeze-defying physics was Sushmita Sen in Main Hoon Na. Last our English teacher asked breathily, ‘What’s love?’, in the context of Romeo and Juliet apparently, was Archana Puran Singh (Miss Braganza) in Kuchh Kuchh Hota Hai. But these moments were literally a class apart. Because Bollywood's 'college kids' do everything apart from studying — both in real life (there are exceptions; they prove the rule), and in reel life. So, the very moment you thought Bollywood movies are coming of age, and resembling the real world, the trailer of Karan Johar’s Student of The Year 2 dropped. You are living under a big rock if you think that this is just a movie. This franchise represents Bollywood’s metaphorical school, from which Alia Bhatt, Varun Dhavan and Sidharth Malhotra graduated in 2012. Alia Bhatt went places and earned a pretty good name for the school — which will now see Tiger Shroff, Ananya Panday and Tara Sutaria graduating. These students have no stress, no students-wala strain in their lives though — they have no classes to attend, no exams to take, no deadlines to meet. They just jump, waltz, swing, run, dance, fight, take part in various competitions — and do everything to shame the idea of being in a library, like anytime ever, in your college life. They dream of having a trophy in one hand and a girlfriend in the other. They also dream of winning some big dance competition which will make their lives sorted. Like, totally. EC must be looking suspiciously at Student of the Year 2, wondering if it is a biopic of Smriti Irani. And of course, they have the most spacious college which looks like Buckingham Palace and the most energetic teachers, one of whom announces the big game night open, as if he was a host of Wrestlemania. All these tiring details are swiftly revealed in the trailer — which also promises a love triangle between Tiger, Ananya and Tara Sutaria. The trailer devotes a considerable amount of time showing Tiger Shroff sweating it out in his gym. This is the only real-life influence the movie seems to have. This crew graced Koffee With Karan earlier this year and left the audience thoroughly unimpressed. The same can be said about the trailer as well. Before you start googling 'Tara Sutaria' now, as you already know Tiger and Ananya (Chunkey Pandey's daughter), Tara is that one element in this case which will check the ph balance of the nepotism debate that will soon start resurfacing. She is the Siddharth Malhotra here — no chacha-bhatija in Bollywood. But she has worked as a video jockey. What the trailer doesn't tell us is whether Tiger Shroff is visually impaired in the film. According to various reports, he is, but we couldn't verify this from the trailer, given the mindboggling stunts he is performing. This is the reason why we'll have to visit the theatre once it's released on May 10. Also Read: Why these Bollywood stars can't vote but can do dynamite desh prem dramas!